Nathan’s began as a nickel hot dog stand in Coney Island in 1916 and bears the name of co-founder Nathan Handwerker (June 14, 1892 – March 24, 1974), who started the business with his wife, Ida Handwerker, née Greenwald. Ida created the hot dog recipe they used, and Ida’s grandmother created the secret spice recipe. Jewish immigrant Handwerker arrived in New York City in 1912 and soon found work at the Coney Island, Brooklyn, restaurant Feltman’s German Gardens. By one account, he was encouraged by singing waiters Eddie Cantor and Jimmy Durante to go into business in competition with Feltman’s; as United Press International noted in 1974, “There are many stories about Nathan and how the business began, but this is the way he told it…” The company’s official history does not mention the future stars’ encouragement. Nathan and Ida spent their life savings of $300 (worth about $7,000 as of May 2018, accounting for inflation) to begin the business. Handwerker undercut Feltman’s by charging five cents for a hot dog when his former employer was charging 10 cents. At a time when food regulation was in its infancy and the pedigree of the hot dog particularly suspect, Handwerker ensured that men wearing surgeon’s smocks were seen eating at his stand to reassure potential customers. The business proved immensely popular. 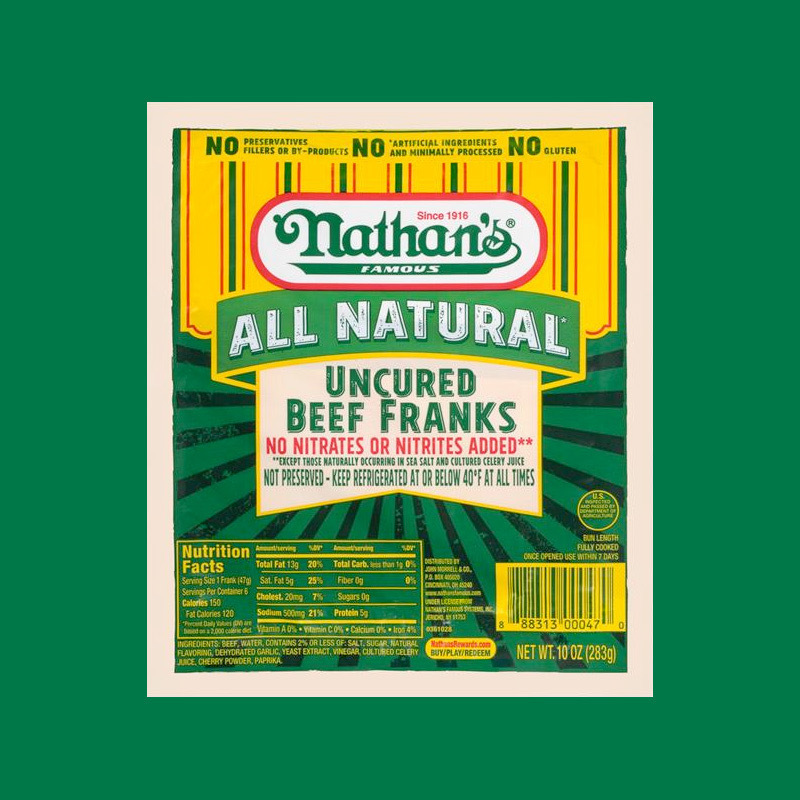 Nathan’s Famous Premium, All Natural* Uncured Beef Hot Dogs come six (6) in a pack. They have the same Nathan’s Famous original taste we love. But made with NO added nitrates or nitrites, NO preservatives, NO artificial ingredients and NO corn syrup. Pick some up at your favorite local grocery retailer and make sure your next hot dog has the nostalgic Nathan’s Famous taste America loves. After picking up a new grill that was long-overdue. It was finally time to grill some hamburgers and hotdogs. I try to eat organic and exclusively all-natural foods. It’s much easier today then it used to be back in the day. There’re a lot of alternative brands on the market today that cater to consumers that care about what they put in their bodies. Granted hot dogs are not the most nutritious food on the planet, but they’re pretty much is American as apple pie especially during the summer and on 4th of July Independence Day. So after picking up some all natural hot dogs free of all the toxic fillers. I was able to find some Nathan’s Famous all-natural Mustard. But I was craving the old school flavor and snap of the old original Nathan’s hot dogs I had as a kid. I stop purchasing them because of all the additives and nitrates, preservatives and who knows what else. So I made a phone call directly to the company that’s still here on Long Island New York. And I mentioned about the other natural brands on the market, and I said if you guys can make an All Natural Nathan’s Deli Style Mustard why can’t you make an all-natural hotdog? It would be absolutely fantastic. I get the flavor and nostalgia that I crave, without all the additives and preservatives that are bad for you. So they took my advice in 2018 and launched the Nathan’s Famous: All Natural* Uncured Beef Franks; with No preservatives, No artificial ingredients and minimally processed, No nitrates or nitrites added. As a kid I used to love all the Nathan’s restaurants with all the pictures of the glory days of Coney Island and the cool game rooms of course. And I will never forget the first time I ever went to the original restaurant at the corner of Surf and Stillwell Avenues. 1310 Surf Ave, Brooklyn, NY 11224. Guess the keyword here is nostalgia, and there’s absolutely nothing like the clinking and clacking of the rickety old best roller coaster in the world the Cyclone (roller coaster), and the electric glow of the neon lights from the Wonder Wheel (ferris wheel)! I guess getting back to the original recipe mean something to me, keep it simple stupid! And every time I bite into a Nathan’s Hot Dog I instantly get transported back to my childhood. And I wouldn’t even be here for wasn’t for my grandparents that met and fell in love while meeting each other at Coney Island.